Actress Heather Locklear spotted with boyfriend Chris Heisser after her rehab break. 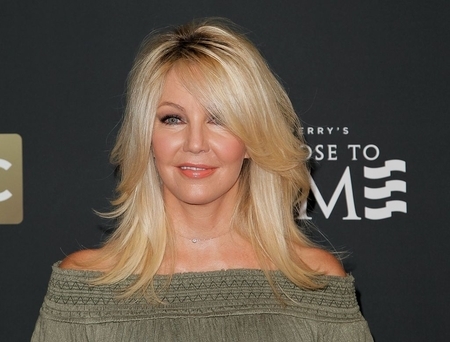 Hollywood actress Heather Locklear recently got spotted with her boyfriend Chris Heisser for the first time after her latest rehab discharge. As a matter of fact, the couple reportedly split last week so that Heather could focus on sobriety from the drugs abuse. Heather got admitted to rehab in early December last year after getting into a fight with Chris, though previously being put on an instinctive psychiatric of 72 hours taken on 18th November. The former Melrose Place actress got captured in pictures with her on and off boyfriend in Beverly Hills LA on 20th January whilst she was filing up her Porche's gas tank. The 57 years old actress looked all casual as she opted to be dressed in washed blue ripped jeans, white top, dark blue sweatshirt jacket, and a black knitted beanie. Heather completed her outfit by stepping in a pair of black ankle converse. Likewise, Heisser looked all casual as well in faded blue jeans, black boots, black muffler, and black sweater. After being done with filing up the tank, the couple later headed to watch the blood moon eclipse together, Daily Mail reports. The troubled actress has been following with some bad incidents since last year. Only in June 2018, Police arrested the blonde actress after she downed a bottle of tequila and then crashed her car at her Home in Cali. And when the police arrived after receiving a disturbance call from the residence and tried to comfort her, Heather ended up attacking them, punching one police who tried to separate her from her parents and even kicked an EMT who attempted to strap her. The authority only released her a few hours later as she had to be rushed to the hospital after being overdosed. As a matter of fact, this arrest comes after a week followed by her previous arrest just a week before when Locklear reportedly choked her 85 years old mother, Diane Locklear and threatened to kill her. However, the actress realized her deeds and battles with addiction last September and wrote a message on her Instagram account about healing and recovery. Heather's 2018 looked all problematic, but at least to its safe to say now that her 2019 looks healthy and positive so far.